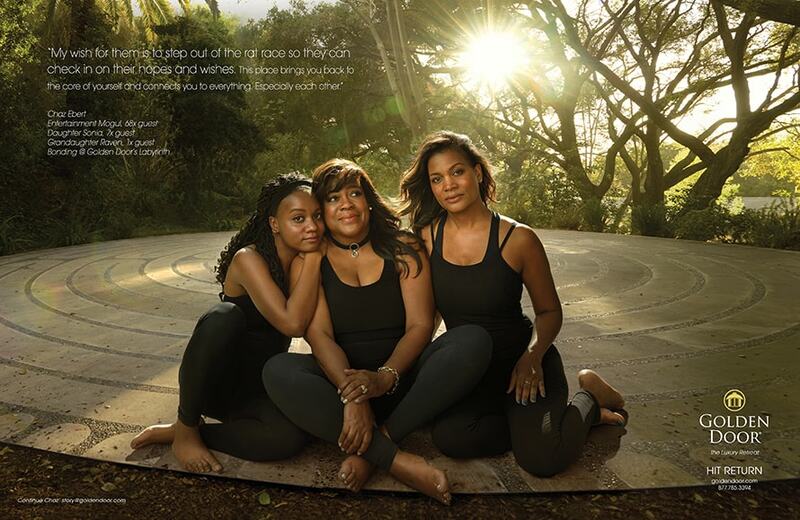 Chaz Ebert, entertainment mogul and widow of Roger Ebert, appears with her daughter and granddaughter in Golden Door's campaign photographed by Annie Leibovitz. It was obvious to the partners at Grace Creative that legendary photographer Annie Leibovitz would be the perfect person to shoot a new campaign for their client, a San Diego-area luxury retreat called Golden Door. But a boutique agency actually landing one of the photo industry’s biggest names for an under-the-radar regional brand? That was no small challenge. Some strategically placed emails put the proposal in front of Leibovitz’s people, with the description of Golden Door as a transformative destination where folks of a certain age (and income level—the tab is about $9,000 per week) can relax and regroup. Then they heard back. Leibovitz was curious to hear more. Several back-and-forth conversations involving Sjogren, writer-partner Susan Colby and the 68-year-old photographer this spring cemented the deal. The Leibovitz print ads launched this month with a double-page spread in The Hollywood Reporter, coincidentally (and fortuitously) in an issue with a cover story on “Hollywood’s Age of Anxiety.” The campaign will continue through the rest of the year, appearing also in Worth magazine, and will run across social and digital media and out-of-home, including in some unconventional spots like airport VIP lounges to capture high rollers. The series features portraits of Chaz Ebert, entertainment mogul and widow of beloved film critic Roger Ebert, culinary power couple Chef Ludo and Krissy Lefebvre, wine entrepreneur Pavi Micheli Lawson and style-media maven Joe Zee. Leibovitz arrived at the two-day shoot at Golden Door in April with a 30-member entourage that functioned like “a very well-oiled machine,” Sjogren said. Two days later, the work was complete, with Sjogren serving as art director and Colby writing copy. The execs, who are both creative directors on the project, had interviewed the subjects extensively beforehand, supplying Leibovitz with bio information and backdrop ideas. The resulting portraits are, in typical Leibovitz style, lovely, unexpected and evocative, with the Lefebvres surrounded by chickens at the resort’s “Biointensive Farm” and Zee in fencing gear in the on-site bamboo forest. Internal research showed that 50 percent of Golden Door’s guests have visited 10 times or more, so the campaign, dubbed “Human Again,” tries to capture what it is about the place that keeps bringing people back. The ad stars have visited the property multiple times. "It’s made us feel like we shouldn’t limit ourselves just because we’re not a giant agency." Grace Creative, whose clients include Dreamworks, Disney and The Biggest Loser Resorts, has released behind-the-scenes bits from the Leibovitz photo shoots and interviews with the ad stars on the brand’s website. 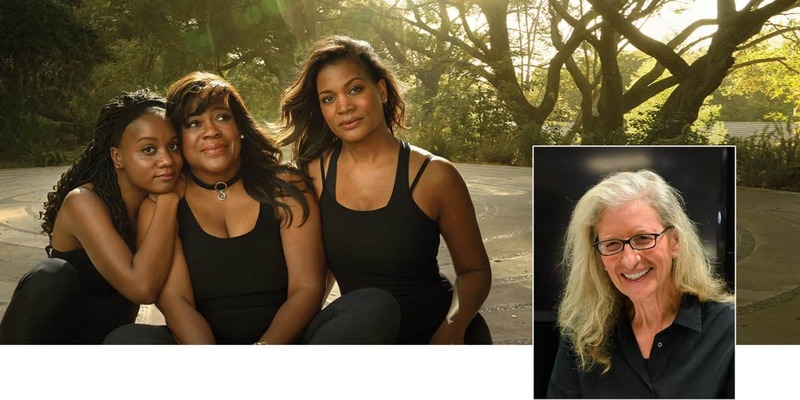 Sjogren and Colby, who met at Della Femina in the late 1980s and list Chiat\Day, BBDO, DJMC and Disney on their CVs, called the campaign a career high and a validation of their focus on the over-50 female audience.